The 2017 KMC Cross Fest kicked off the first weekend of competition of the Sho-Air US Cup-CX series at Thompson Speedway Motorsports Park in Thompson, Conn. on Friday, Sept. 29th. The elite men’s and women’s UCI Category 1 races saw all the leaders bunched together and both contests came down to the final turns and final sprints. Kaitlin Keough (Racine, Wisc./Cannondale/Cyclocrossworld.com) and Tobin Ortenblad (Santa Cruz, Calif./Santa Cruz/Donkey Label Racing) took the wins in the Friday night Category 1 events. They also grabbed the early leads in the Sho-Air-US Cup-CX series. The women began the Pro CX C1 race in a large group of 11 riders, with Canadian Maghalie Rochette (CLIF Pro Team) driving the pace. The group would eventually splinter down to a group of five comprised of Keough, Emma White (Delanson, N.Y./Cannondale/Cyclocrossworld.com), Christel Ferrier Bruneau (SAS Macogep Aquisio), Crystal Anthony (Maxxis Shimano Pro Cyclocross), and Rebecca Fahringer (Stan’s Notubes p/b Maxxis/GoFahr). Rochette would attack Keough and White until the final turns taking it into a track sprint but Keough would overtake her in the final meters. "It’s a hard course," said Keough, making the win her second C1 victory this year, the first coming at Jingle Cross in Iowa City, Iowa. There was nothing that was really splitting it up. That last lap Maghalie and I were pretty much sprinting the entire lap. I think I went the first half and she went the last half. She’s really strong over the technical sections." Rochette pushed the pace for most of the six-lap race. "It was pretty painful. On the last lap Katie went in front of me. I knew it wasn’t windy, so I thought I would lead out the sprint. And in the final corner, I said ‘I gotta go now’. I just sprinted and she nipped me at the end. That’s OK. 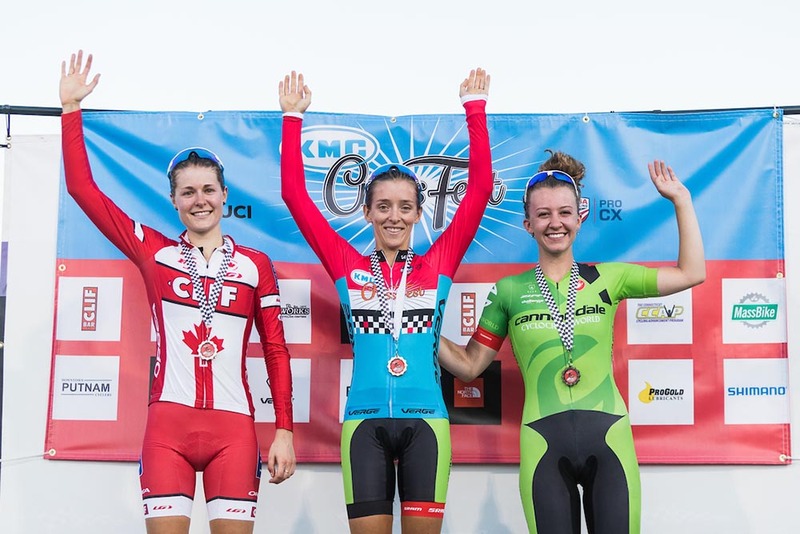 It was a really good race," the Canadian National Champion added. The Elite Men’s ProCx C1 race was tactical from start to finish. A group of nine would go into the final turns together. It was Ortenblad pushing to the front with an inside line in the last corner at Thompson Speedway to outlast 19-year-old Spencer Petrov (Mason, Ohio/Aspire Racing), who earned second. Jack Kisseberth (JAM Fund/NCC) would take the line for third. Stephen Hyde (Cannondale p/b CyclocrossWorld.com), who won this race last year, would finish fourth. "it was such a crit dynamic, it was such a big group. (Stephen) Hyde, Jack and I had a gap at one point. It came back together. There were just small attacks and no big stuff though. I was pretty confident that I could win a sprint out of the group with the top guys. I put on a bigger gear for tonight, because I knew it would be a super fast finish," said Ortenblad about no big attacks taking place during the nine long laps. "I tried to stay at the front. There might have been a pinch of hesitation going into the last chicangs and the hairpin into the sprint. I just went as hard as a I could. I thought if I was going a hundred (miles an hour) no one could probably get by and wound it up from there." With wins in the C1 events, both Keough and Ortenblad take the early leads in the Sho-Air US Cup-CX series. There are a total of seven races at four ProCX events where points will be earned, and the season-ending winners for women and men will each take home $10,000. "I came into the season and saw the prize purse was huge. I run my own program, so it’s a hustle to find sponsors, to find the money. I knew it was somehting I could potentially win. When you are out there racing you forget about that part, and you just want to win no matter what. I am leading and hopefully I can hold onto the lead for the next couple of weeks," added Ortenblad about earning the lead for the Sho-Air US Cup-CX for the men. 2 Maghalie Rochette (Can) CLIF Pro Team s.t. 5 Crystal Anthony (USA) Maxxis Shimano Pro Cyclocross s.t. 9 Arley Kemmerer (USA) Fearless Femme Racing s.t. 18 Taylor Kuyk-White (USA) Philadelphia Bike Expo s.t. 21 Rebecca Gross (USA) Zero D Racing s.t. 3 Jack Kisseberth (USA) JAM Fund / NCC both s.t. 23 Brendan Mccormack (USA) NBX Bikes s.t. 30 Jules Goguely (USA) s.t.